10 inches of snow fell last Friday morning. Marlie wanted to go outside and play in it. Thank goodness her daddy was up for it because I am allergic to cold weather. I thought she'd scurry back inside once the chill hit her face. Instead, she frolicked like a snow bird and had a grand time. I thought to myself, is this really my child, born in midsummer with Caribbean blood coursing through her veins?! LOLOL @ "allergic to cold weather." Too funny. So adorable! Aren't you in Texas? That is a lot of snow for you guys!! She looks so cute! 10 inches?! Are you OK? 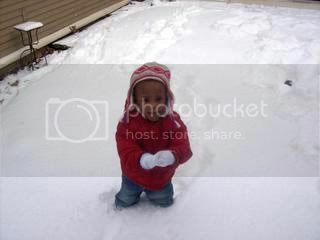 LOL I haven't met a child yet, that didn't like the snow. My kids adore the snow too. We got way more than 10" and the whole time we were outside I kept saying "do you want to go in yet?" and bribing them with candy. It didn't work. * I love her little hat. The only thing I like about snow is the photos! Thanks for sharing! 10 inches! I am sooooo jealous! We were supposed to have gobs of snow this year. It started snowing early, but then that was it. You'd think it was April here. My crocuses have bloomed and everything. We never get 10" all at once anyway. :-( Marlie sure is cute in that hat (well, she's always cute, but even more so in that hat).